Focus on Nut in the Word Nutrition! Keep Nuts fresh by storing in an airtight bag or container. Freeze until ready to eat. Pistachios have no cholesterol and a one ounce serving has only 170 calories. Nuts also offer a host of other nutrients such as folate, vitamin E, phosphorus and magnesium. The nutrition in nuts can quell hunger pangs on fewer calories - making them hard to beat when compared to other snack foods that provide empty calories with minimal nutritional value. USDA researchers recently found that eating pistachios may help you reach your weight-loss goal, partly because some of the fat in the nuts may not be fully absorbed by the digestive system. Pistachios pack another waistline advantage: They offer the most pieces per ounce, so that you can eat more for fewer calories. (Source: Women's Health Magazine: Oct 2011). Eating a single serving of pistachios (about 49 nuts) has a comparable amount of potassium to a small banana. 49 pistachios serve up 20% of your daily value of vitamin B6, about the same as half an avocado. The amount of fiber in one serving of pistachios (3g) is the equivalent of eating about 1/2 cup of broccoli. A single serving of pistachios provides you the same amount of protein in one ounce of soybeans. The sugars in pistachios come from carbohydrates (fiber). Pistachio candies: may contain dairy(milk), nut allergens (pistachios, pecans, cashews).Some nuts used may be processed in plants that process peanuts., Soy, sulfites,wheat. Please contact us at 1-800-368-3081 regarding ingredients questions. NOTE: We do not produce Cashews, Pecans, Pretzels, or dried fruits ingredients used to make some of our products. In some cases, these ingredients may be produced in facilities that process Peanuts, wheat, soy and other nuts, and allergens. We do not process peanuts in our own facility. If you have a food allergy and wish to check the ingredients with us on any product we produce or carry, please call 1-800-368-3081 and speak with a Manager. Green Chili Pistachios: Salt,Jalapeno Pepper, Habanero,Garlic, Green Food Coloring(Yellow 5 and 6, Blue 1, Citric Acid and Sodium Benzoate (Preservative)). Allergens: Tree nuts. Red Chili Pistachios: Salt, Cayenne Pepper, Habanero, Garlic, Red Food Coloring (Propylene Glycol, Red 40, Red 3 and Propylparaben (Preservative)). Allergens: tree nuts. 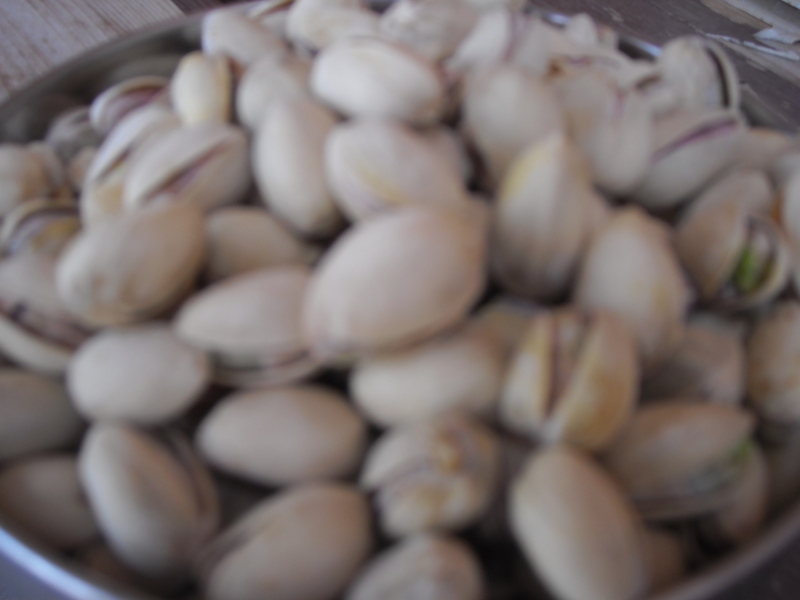 Garlic Pistachios: Salt, Garlic Oil(soybean oil,(soy)), Garlic Powder. Allergens: tree nuts,soy. Lemon Pistachios: Salted Pistachios(Tree nuts),Lime Juice(water,concentrated lime juice, sodium benzoate(preservative),sodium metabisulfite(preservative)), Lemon Juice(water, concentrated lemon juice, sodium metabisulfite and sodium sulfite(preservative),lemon oil), lime salt(salt,citric acid,lemon powder(dextrose,citric acid, maltodextrin & lemon oil), lime powder(dextrose, citric acid & lime oil), silicon dioxide, natural lemon lime flavor oil (soybean oil, (soy)). Allergens: tree nuts,soy. Ranch Pistachios: Salt, MSG maltodextrin, dry garlic, dry onion, guar gum, parsley, spices, soybean oil, and or silicon dioxide to prevent caking. Allergens: Tree nuts, soy. Habanero Limon Pistachios: Salted Pistachios(tree nuts),lime juice(ater,concentrated lime juice, sodium benzoate(preservative),sodium metabisulfite(preservative)), lemon juice(water,concentrated lemon juice, sodium metabisulfite and sodium sulfite(preservative),lemon oil), lime salt (salt,citric acid), lemon powder(dextrose, citric acid, maltodextrin and lemon oil), lime powder(dextrose,citric acid and lime oil,silicon dioxide), natural lemon lime oil(soybean oil, (soy)), Habanero Powder. Allergens: Tree nuts,soy. Cracked Pepper Pistachio Nutmeats: Salt Pistachio Kernels(tree nuts), Onion Powder, Black Pepper, Black Pepper Flavoring Oil(soybean oil(soy)). Allergens: tree nuts. soy. Roasted/Salted Pistachios: Salted Pistachios(tree nuts). Allergens: Tree nuts. Spicy Ranch Pistachios: Salted pistachios(tree nuts), MSG Maltodextrin, dry garlic, dry onion, guar gum, parsley, spices, soybean oil, and/or silicon dioxide to prevent caking, habanero powder. Allergens: tree nuts, soy,MSG. BBQ Pistachios: Salted Pistachios(tree nuts), Onion, Garlic, Black Pepper, Papain, Mesquite, MSG, Paprika, Soybean Oil(soy), Spices. Allergens: Tree nuts. soy. Pistachio Brittle: Corn Syrup, Salted Butter, Sugar, Salted Pistachio Kernels,Vanilla Flavor (water, vanillan, caramel color, ethyl vanillin, citric acid, sodium benzoate(preservative)), Baking Soda, Vegetable Oil Spray on pans(water,soybean oil, soy lecithin, potassium sorbate& sorbic acid(preservative), propellant. Nutritional Values: 1 serving is 194.7 calories, 110 calories from fat (56% of daily value) , Total Fat 12.2g, Saturated Fat: 5.4g, Sodium 55.7mg, Total Carbohydrate 20.9g, Dietary Fiber 1 g, Sugars 17.9g, Protein 2.1g Allergens: Dairy, tree nuts, Soy. Atomic Hot Chili Pistachio Brittle: Corn Syrup, Salted Butter,Sugar, Salted Pistachio Kernels, Vanilla Flavor (water, vanillan, caramel color, ethyl vanillan, citric acid, sodium benzoate(preservative)), Baking Soda, Ground Habanero Powder, Vegetable Oil Spray on pans(water,soybean oil, soy lecithin, potassium sorbate &sorbic acid(preservative), propellant. Allergens: Dairy, tree nuts, Soy. Cocoa Roasted Pistachios: Salted pistachio kernels, sugar, unsweetened cocoa powder, ground cinnamon, vanilla flavor (water, vanillin, caramel color, ethyl vanillin, citric acid, sodium benzoate(preservative)), and caramel extract (propylene glycol, artificial flavor (contains alcohol), water, caramel color, contains sulfites)). Allergens: tree nuts, cocoa may be processed in plants with wheat, soy, dairy(milk), Sulfites. Butter Toffee Pistachios: Salted pistachio kernels, sugar, Vanilla flavor (water,vanillin, caramel color, ethyl vanillin, citric acid, sodium benzoate (preservative)). imitation butter extract (water, propylene glycol, artificial flavor (contains alcohol)), imitation caramel extract (propylene glycol, artificial flavors (contains alcohol), water, caramel color, contains sulfites)). Allergens: Tree nuts, Sulfites. Cinnamon Pistachio Bites: Salted pistachio kernels(tree nuts), sugar, ground cinnamon, vanilla flavor (water, vanillin, caramel color, ethyl vanillin, citric acid, sodium benzoate(preservative)), pure cinnamon extract(made from alcohol,glycerine,natural cinnamon oil,water), Vegetable oil spray used on pans(water,soybean oil(soy),potassium sorbate& sorbic acid(preservative),propellant). Allergens: Tree nuts,soy. Margarita-Lime Pistachios: Salted Pistachio Kernels(tree nuts), sugar, sea salt, natural flavor oils: Key Lime Flavor Oil(soybean oil(soy)), Natural Margarita Type Flavor Oil(soybean oil(soy)). Allergens: Tree nuts, soy. Sugar Free Pistachio Brittle, Sugar Free Chili Pistachio Brittle and Sugar Free Pecan Brittles: contain sugar from the nuts. Nuts have natural sugars from fiber and protein (carbohydrates). There is no sugar added. Please see complete nutritional label. Contain maltitol and sugar alcohols. Allergens: Tree nuts, dairy, soy. Pecans may be processed in plants that process peanuts. White Chocolate Pistachio Clusters: White chocolate (sugar,partially hydrogenated palm kernel oil, whey(milk), artificial color, titanium dioxide, sunflower lecithin, natural flavor,vanilla), salted pistachio kernels(tree nuts). Allergens: Tree nuts, milk. Nacho Jalapeno Pistachios: salted pistachios, water,black pepper oil(natural flavor,soybean oil(soy)), cheddar cheese powder(dehydrated blend of cheese(granular & blue),pasteurized milk (milk,cheese culture,salt & enzymes),partially hydrogenated soybean oil(soy), whey protein concentrate(milk), lactose, maltodextrin, salt, sodium phosphate, citric acid, lactic acid, yellow 5%6), ground jalapeno powder, salt. Allergens: tree nuts,milk,soy.